Finally, Mailbird for Windows 10 is Here! …and has been delivered to millions of PCs and devices of patient users all over the world already. Microsoft has announced it to be the best and most beautiful Windows yet, that makes you a master at multi-tasking and adapts to you and your behavior transforming your PC in to your personal assistant. It introduced new technologies such as Cortana integrated in the new web browser Edge, which allows you to write or type directly on web pages and now Microsoft is taking the PC experience to a new level. We believe you need an email client that matches the new, beautiful appearance for Windows 10. An all-in-one communication and productivity suite that can keep up with the most productive Windows ever , putting old-fashioned and cluttered clients out of business. Welcome to the Windows 10 version of Mailbird. It’s glorious. Feedback on Mailbird for Windows 10 has been awesome, starting in just the first hours of the launch. Many Windows 10 fans are complaining about the native Windows 10 email client, saying that it has been disappointing. Q: What brought you to Mailbird in the first place? A: Because Windows 10 default email client fails at “Email Privacy Tester” and at displaying quoted messages from Mac’s email client. After trying Windows 10 Mail, I still prefer Mailbird over Mail 🙂 Mailbird feels more minimalist, lightweight, and has better shortcuts. Also, Mailbird shows all mail in the same thread on the same page, which Mail doesn’t. Q: What is the most important feature of Mailbird? A: Perfect Windows 10 Integration! Recently, I migrated to Windows 10 and I was torn away with the limitations of the Windows mail app. That’s when I told myself enough is enough and I started searching for a new mail app. So I headed to Google search and started looking for the “best windows 10 mail app” and there it was “Mailbird” popping on the first page. At first, I was hesitant to upgrade to the Pro version so I started the trial version while watching the video of getting started with Mailbird. I kept smiling as I learned about all the great features and shortcuts. By the time the video ended; I was completely sold! I went right ahead and purchased the Mialbird Lifetime package. Thank you Mailbird and I cannot wait to share this app with friends and family. Not only have we improved the speed in which messages are being send, especially from slower servers. We also added a new Auto Layout Feature. The Mailbird All- Star development team has been working hard to improve the Touch Screen Support in Mailbird. Even though it is not native, you will be able to enjoy Touch support using Mailbird in Windows 10 and LOVE it. We also added a new App called Degoo. 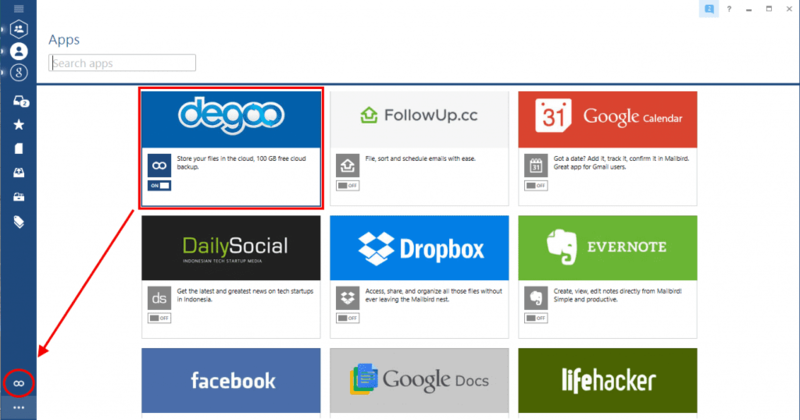 Degoo is a free backup service that gives users automatic, secure online backup in exchange for sharing some of their unused hard drive space. This comes in very handy for people that have to send out large number of files in one email. Find out more about Degoo in our next blog post. Update to Windows 10 now and simply swipe away all your email problems once you get on Mailbird – one of the best apps for Windows 10. Editor’s Note: This post was originally published in July 2015 and has been updated for accuracy and comprehensiveness. 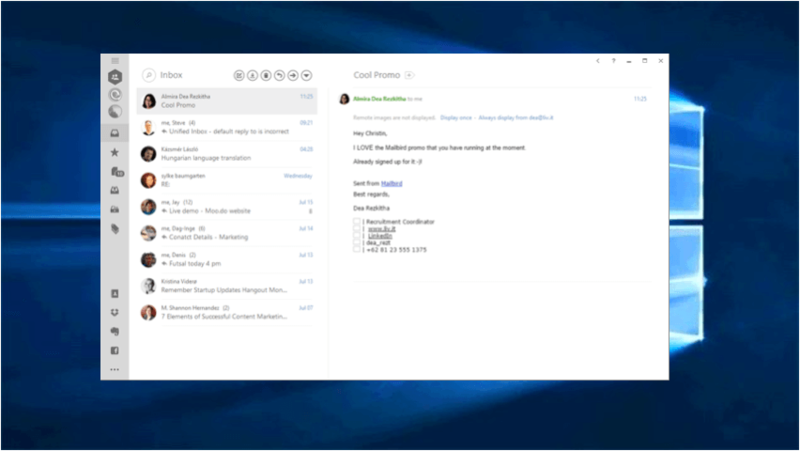 209 thoughts on "The Best Email App for Windows 10 in 2019"
So far the best client in Windows… clean, minimal and functional. Support has been great. They had not only solved an impending issue I had faced through active updates, but adapted a few suggestions I made too. Still there are many features that are left to be adapted to make MB perfect and I am sure they will soon. I’ve updated Mailbird to the latest version on my Windows 10, but I did not see the auto layout option. Am I missing anything? It will work only if you are using a tablet. Hey guys, thanks for your awesome and loyal support, that really means a lot to us. We are always looking for motivated and supportive Alpha Testers like you are, so let me know if you are interested:-) Have a great week. Are you going to look into W10 Action Center / Tiles integration? Really that’s the only thing W10 Mail App has going for it. Hey Viniter, thanks or your feedback. we are actually looking into that, but can not guaranty that it will be possible. We will keep you guys updated on that though;-) Happy Friday. I’ll love it, but since the last update yesterdays I haven’t been able to launch the program. I am using windows 10. Do you have any solutions? I try to reinstall but that did not help. I miss my mailbird! Have you tried to restart your Windows? Also, could you check your Task Manager, to see whether Mailbird.exe is running or not. Lastly, is there any error message pop up when you start Mailbird? can anyone tell me : does Mailbird have the “Unread email” across accounts like win live mail had. i.e. showing all unread emails from all 3 of my email accounts without having to switch between them. I am really enjoying W10 much better than W8!! Interesting…I’m gonna give it a try. Thanks! Hey Midoo, please send us a mail to support(at)getmailbird.com. We will happily try to fix the issue for you asap. I use Google apps and found mailbird to be one of the most resposive IMAP clients out there. Particularly when dealing with chunky inbox’s! Thanks for your awesome support and feedback Jake. Let us know if you have any questions that you may need help with. I like the new version of Windows. I must admit thought that for me, it was rather hard to get used to all of the changes in this new version. Welcome to the family Erica:-) Let us know if you have any questions by simply sending a mail to support(at)getmailbird.com. Windows 10 is definitely a nightmare; know people who had to take their computer to a pro to have it taken down and they lost everything on their computers. I was lucky that I was able to uninstall it before it damaged my computer. Should you ever get tired of it, give Mailbird a try:-) It is free and will soon launch the Import feature from other clients, that will make the move very easy:-) Happy weekend. Love the layout and hoe the mail are organized . Thanks Ling. Please do let us know at support(at)getmailbird.com should you ever come across any questions you may need help with. I’ve used it and like it. Its’ simple. I am loving my windows 10 laptop. working all the time on it. I love the layout and all its features. I use Thunderbird for my e-mail. Windows 10 is really not bad. Mailbird on the other hand is really excellent, compared to other M$ alternatives!!! Welcome to the family Tom:-) Let us know at support(at)getmailbird.com if you have any questions. Seriously looking into Mailbird but first I need W10 to get some bugs fixed. I have to boot up in safe mode at least onc a week to get W10 to work or I get the Cortana windows error a lot of people seem to be getting. Thanks for your feedback Jenni. Yes, we do have a lot of people saying that. Feel free to contact our support, if you think there is something that we can help you with;-) Have a great day. Welcome to the family:-) Let us know if you have any questions. I tried it on Win 8.1 first. It seems the same on Win 10 to me. I don’t have Windows 10 unfortunately I haven’t been able to upgrade. I’ve used 10 before and love it, it’s so much easier. Wishing for the best. Great site you have very good information. Tried the free upgrade from W8.1 to W10 but had endless issues with computer crashing and restarting. Finally did a fresh install and it’s crashing less but still restarts for no reason from time to time. So annoying. Wow, can’t believe I never heard of Mailbird. I will definitely investigate further. Currently you can not set the in Mailbird. You can set them in your webmail and it will be applied to your mails in Mailbird. Let us know at support (at) getmailbird.com if you have any more questions. I decided to wait to upgrade because so many people had issues. and I’m still waiting lol. I prefer Windows 8.1 & I have paid a guaranteed for life price of $19.95 for yahoo email for the past 4 years. I prefer paying it, not having ads to deal with & 24 hr tech support although I’ve only needed it twice. I am loyal to yahoo as I was one of their first original 10,000 email account holders back in 94/95 I think. Loved my Windows 8, downloaded Windows 10 and I’m starting to fall in love again. I do have to admit that the Windows 10 is ALOT different than Windows 8 in my opinion, but there are so many new apps and gadgets that I’m getting used to it! Mailbird is the best email client ever on my Windows 10. I like windows 10 much better it’s easier to use. It seems Mailbird is a get app to use esp for windows 10 but I am always normally the one who is last to try anything new esp on my pc. I am wary of downloading new programs until i either forced to use them or i have to have them to make the computer actually run otherwise I wait and see how others feedback of a program will maybe influence me to try it sooner. Thanks for sharing your feedback Melly. 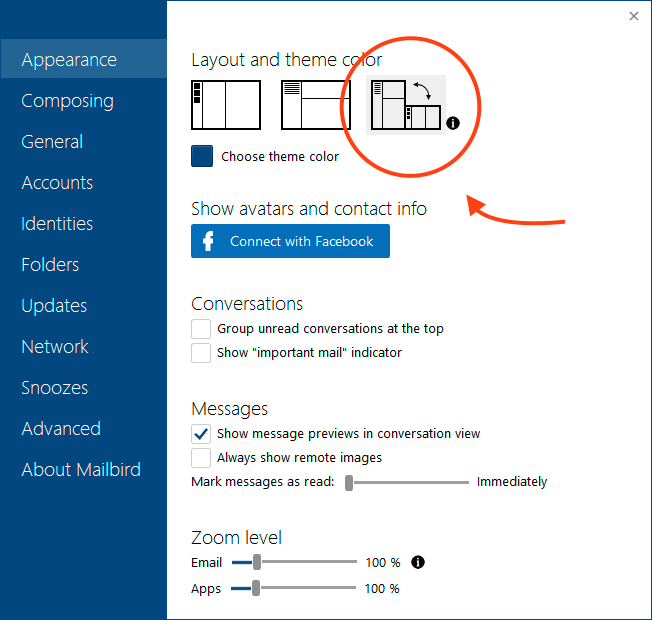 Please let us know if you need any help setting up Mailbird, once you have decided to try it. Also, if you have any questions before you would like to try Mailbird, please send us a message to support (at) getmailbird.com and we will help you asap. Happy Monday. mailbird really improves the functionality of email for w10! So far I’m really digging the Windows 10 since I updated. Windows all the way! Welcome to the family Susan. What do you prefer using then? Are you a Linux or OSX user? Why does McAfee consider the site a ‘security risk’…? Hey Luke, thanks for your feedback. As long as you got the Installer from our website (getmailbird.com) we can guarantee you it is a false positive and you can download it without any worries. Let us know if you have any further questions. Awesome:-) Let us know at support (at) getmailbird.com if you have any questions. Just installing it.. lets see how it is. based on reviews, it looks interesting. Welcome to the family. Let us know at [email protected] if you have any questions. So I have to pay if I have more than 3 email accounts? Hey Boyd, if you want to add more than 3 accounts to your Mailbird, then Mailbird PRO or Lifetime would be the best option for you. Works quite fine in surface. I may give Mailbird a try it looks very interesting. Thanks for your awesome feedback:-) Have a great week. Looking forward to trying it out. Thank you! Great features!Will look into it for sure! Updates with errors and having to continuously roll back, techs who don’t understand the issues after you’ve exhausted resources to resolve prior to. Hey we are sorry to hear that. Just to be clear, are you referring to Mailbird or Windows10? Yes, many user are facing this issue. Sorry we cant help with that:-( Have a great start into the week anyways. I have it and I hate it! Hey Rita, are you referring to Mailbird or Windows 10? Much easier to use then W8 , love the features. I’m still looking for a better way to manage my mail. Mailbird might be the answer. I still use Gmail for most things, but it can be frustrating. I also think it’s provided me with plenty of bad habits. I’d like to find a more focused way of dealing with email that allows me to stick to the keyboard, rather than breaking it up with mouse/touch movements. Hey Gregg, its a pity you would think that. Some of the Antivirus programs detect it as malware but we can ensure you it is a false positive and you can add Mailbird to your antivirus’ white list. Let us know at [email protected] if you have any further questions:-) Have a great day. No it is not what I think,it is what the anti-virus says, I am Dave outside the pod door tring to convince HAL to let me in.Yeah we all know the letters that make up HAL is IBM ,each letter was made one letter backwards in the alphabet. Is this free? I like FREE, I will give you a LIKE later to show my gratitude. After looking at all the reviews below, i would like to try Mailbird…. :)…. I also wish to do this .I have lots of customers which I wish to add into specific groups so that I can send one email to all .Is that the same as what you want ? Would someone care to explain the email I got today from Mailbird CEO Andrea Loubier, who said …and I quote “We would like to use this opportunity to say how grateful we are for your patronage for this past 2 years. For your loyalty and dedication we offer you a one time chance to get Mailbird Pro Lifetime for only 50% off the normal price” When I checked this out IT IS ACTUALLY CHEAPER TO BUY DIRECT FROM THE MAILBIRD WEBSITE ………..and you dont have to have been a loyal and dedicated user at all. Leaves me with such a wonderful feeling of being valued !! I’m not happy with the program. I live in two places alternately and whichever address the sender has used to contact me can’t be changed. Eg if I’m in Gibraltar and someone sends an email to my UK address then I can’t reply by just changing the ‘from’ address. To reply I have to go to webmail of the server it has come through… so to me this is just a backward step. I’m sure I can’t be the only one with this issue. Very frustrating. Unless anyone knows a ‘work around’? Hey Debbie, thanks for your question. Are you referring to folders on your desktop or in your Mailbird? In Mailbird you can create folders that you just drag&drop email into for example. As for folders on your desktop, you can go into the message source and save them one by one as an .eml file on your desktop. I hope this helped? does it select all and delete? I need to move emails from a Fatcow account into Gmail – can I do this by dragging and dropping through this free mail client? I don’t see Exchange support, so I’ll have to pass. All I want is a simple client to connect to my companies exchange server. There’s a ton out there for cell phones, but none for PC? I just don’t want to have to boot up the company laptop just to send an email. Sure I can do it with my phone, but if I’m already in front of my PC, I’d rather just do it here real quick rather than booting up the laptop when I need a real keyboard. I normally collect email on my mac at home but also have a Surface Pro 4 running W10 that I use when I am out. I want its email on the SP4 to behave like an iPad’s. So download the mail when online for offline reading, never delete anything from the server because that’s the main Mac’s job, delete old mail so I only have a few weeks of email on my device to stop it eating up my disk space (so Outlook is out!) but leave it on the server if it is still there. My Mac is set to delete from the server after a week so all my devices have a chance to download new mail and it also uses Spamsieve to clean the mailboxes. Can Mailbird give me this iPad-style mail please? Hey Tim, thanks for your message. Let me break it up to be able to answer your question as detailed as possible. Never delete anything from the server because that’s the main Mac’s job? Yes if you use IMAP and do not delete the email from Mailbird. Deleting email from Mailbird will also delete the email from the server. Mailbird can’t delete emails automatically, but it can delete emails that is not in the server anymore if you are using IMAP. I hope that helped you answer your question. If I switch to Mailbird, will the program be upgraded BEFORE Windows upgrades to the next version? I want to be sure Mailbird has sufficient development to ensure it will always work. I have looked through a great many of these comments and questions and have yet to see my biggest complaint to windows 10 mail: can you work with an address book, adding to and deleting contacts? This issue alone makes MS Mail an absolute waste for me. Hey Jon, thanks for getting in touch. We are soon releasing our new Contacts Manager with Contacts Sync. You will then be able to edit and work on your contact details as you wish:-) Ideally we will be launching the new Contacts Manager into the Alpha this week:-) So its not long to go anymore…Let us know if you have anymore questions. I downloaded and installed “Mailbird”, and it might just as well be “Jailbird”, as it appears to be totally non-intuitive and obtuse.. You say I require a SEPARATE APP to simply manage email addresses??? That is one of the dumbest things I have ever heard. Managing addresses is a fundamental requirement of ANY email client. I am not sure why, but you may have understood. There is no separate app required. The next big update will release a fantastic contacts manager feature to Mailbird. So where is documentation that tells how to use the current one I see a box that says “Contacts”, which got three “contacts” from somewhere, that are indeed people I know. Unfortunately, I see nothing further about those contacts, no way to edit them, and the software will not even let me delete them. Have a great week and let us know if you do decide to give Mailbird a try anyways and have questions about it. I am planning to download Mailbird to my desktop PC running Windows 10 (to replace the Windows 10 mail app) – will it cope with my Hotmail, Live, Outlook, Gmail and Plusnet addresses ? Also, will my emails be stored on my PC and on the net ? I am about to upgrade from Vista which has Windows Mail 2006 to Windows 10 with a new computer. Will mailbird allow me to import my Windows Mail emails to local folders and use them (ie forward, reply, etc) in the future? My laptop has been downgraded from Windows 10 to 7. Is it still possible for me to use Mailbird? Hey Sophie, yes you can install Mailbird on your Windows 7 and use the same licence again. If you need help with setting everything up and getting your licence key again, let us know. Our support team will help you solve anything:-) Just send them an email to support(@)getmailbird(dot)com. Can you organize your contacts into groups? Can I block spam and junk mail? 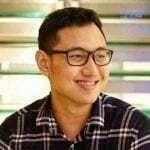 Will mailbird import from yahoomail? Will it delete from both yahoo and mailbird or do I have to go to yahoo to delete messages I have read? Please go ahead and try Mailbird 🙂 It looks like it’s a great fit for your needs. I am lookinig to replace may Outlook 2016 as it is a nightmare. What I need is something that will sync my Mail, calendar and contacts with my android. Is mailbird the solution? Using IMAP. Is there anyway to send an urgent message or get a read confirmation receipt? Have a great day and please feel to reach out in case you have more questions. Does mailbird allow the creation of group emails with more than 10 contacts? Also, can you easily create new contacts from emails? Windows 10 mail app won’t do either. Also,how many email accounts can it support? I need 4. We are now using Mailbird on a Win 10 laptop and I find it to be a very easy and intuitive program to set up and operate, yet it is very full featured allowing us to easily send group emails to our employees and manage our 4 pop mail accounts, no problem. Loving it! The price was quite reasonable too! I have more than 25GB of mails in my Windows live mail. Recently I have upgraded to W10. Is it possible to import all these mails to Mailbird ? Does mailbird have automatic email printing? I’m looking for an e mail program that can download then delete the E mail from my email server so my server box doesn’t fill up. Outlook express used to do that, but when I switch to Windows 10 their e mail program doesn’t have that option, does Mailbird? Will it handle 9 different email accounts? Hey Shane, it shouldn’t have any problems handling 9 accounts:-) If you have any more questions before or during set up, please get in touch with our support(at)getmailbird(dot)com. They will try to help as fast as they can. Hello, Does this have option to sync with google contacts? Also does it sync all folder structures (I mean groups) with Gmail contacts? In Thunderbird, though there is a feature, it seems broken. Groups are not properly synchronized. Is Mailbird a 64bit application? When I installed, it shows up as running in 32bit mode. Thanks. Hi. I was a previous mailbird customer and loved the system but it would almost daily somehow lock my yahoo mail account. Have no idea why it would do this. After several emails to the system folks and no resolution had to drop mailbird. Since then the account has yet to be locked out. May try it again just to see if anything has changed. Hey Larry, I am really sorry to hear we couldn’t help you then. As far as I know the issue should be resolved. But please feel free to share your ticket number with us, so I can double check that you would not face the previous issue anymore. Mailbird crashed after an update. It told me that I need to uninstall it and reinstall it. I uninstalled it, now it won’t reinstall. Mailbird really should have support line that we can call to fix stuff like this. I am wondering if I have lost all of the emails in the process. Hey Mark, thanks so much for reaching out. The issue is fixed and you should not have lost any emails. Either way please feel free to get in touch with our support team (support(at)getmailbird.com). They will help you get Mailbird back up and running asap. Thanks again for reaching out and have a wonderful day. I am getting an update alert every time I open mailbird. Is it safe to do the update now? I am looking for an app to replace outlook. I have work emails and personal emails coming through outlook at the moment and I cant seem to find emails older than 1 week old on my work account. I have looked into this and it seems this is a very common problem with Outlook. If I downloaded Mailbird, would I be able to get all my old emails as well? will do, thanks for your speedy response Christin. I am replacing my Vista computer that was using windows mail with new one running windows 10. Can I import my email folders and contacts into Mailbird?